Randi M. Sherman’s The Lobby lets readers be a fly on the wall at the prestigious Shipley Hotel in San Francisco. The many intertwined stories take place over 24 hours from 4:00 a.m. to 4:00 a.m. the next day. The Shipley is hosting both a reunion and a large company conference so there are plenty of interesting individuals, meetings, and possible scandals around every corner. Then there are the tourists: a regimented, bossy husband with his wife who just wants to enjoy her vacation; a couple on their 30th anniversary who are treated to an impromptu wedding; and parents in town dreading their visit with their daughter and her atrocious family. Other fascinating characters also include Oscar Pasternak, a retired actor and longtime resident of the hotel’s upper floors, Mrs. “Bunnie” Rothman who is staying in a six-room suite while her house is under renovations and her husband is away, and a pair of adulterous couples. Add to this mix the many hotel employees including front desk workers, security personnel, the gift shop attendant, the floor polisher, and the florist. All of these characters and stories equal one highly entertaining book. I enjoyed every moment of The Lobby and was quickly immersed in each of Randi M. Sherman’s characters. I was worried that there would be too many story lines to keep up with, but Sherman paints such vivid pictures and created such intriguing characters that I felt like I was there in the lobby experiencing it all. This book made me laugh, cry and cringe at the various behaviors, chance encounters, and hilarious situations. It was fun to read and now I want to quit my job and go work at the Shipley Hotel! I highly recommend this book! The Lobby is an interesting, short read, introducing a host of colorful characters throughout the novel. Author Randi M Sherman has produced an intriguing and humorous tale of love, friendships, and the hilarious side of running a hotel. The Lobby is an old fashioned and stately hotel in San Francisco, which hosts sightseers, business conferences, and some permanent residents. We also meet some elderly people who make annual trips. The characters are numerous so it is difficult to name them all, but Hal, the florist, and Hank and Peggy were certainly two of my favorites. The hotel is well known for going out of their way to accommodate difficult or indiscreet clients and the expectations of the rich and famous. A few hilarious incidents with bills will have you giggling! Each guest and staff member has an interesting story and is well portrayed throughout the book. Some are fascinating, others rude and obnoxious, and some just sad and confused. 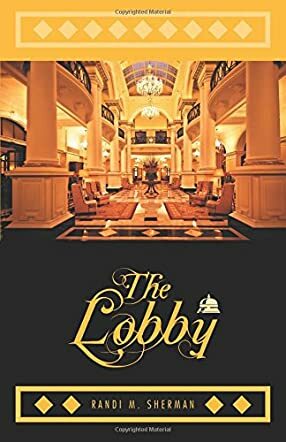 The Lobby by Randi M Sherman takes us on a fascinating journey of the people behind the scenes at a prestigious hotel. A subtle sense of humor runs through the story, with some situations being outrageously funny and some a little bit sad. Generations of people have passed through the hotel and some still come every year. Many more will pass through in the years to come. A new generation also enters the hotel, providing a startling contrast of generations and etiquette. The hotel staff are totally hilarious in the way they assess and assist various people, and their daily machinations and interactions provide for some good laughs. An enjoyable read, showing many different characters and interactions between people of different cultures and eras. I really enjoyed reading The Lobby by Randi M. Sherman. This book is filled with short stories about all different people that pass through the Shipley Hotel in one day. Some of the stories have characters that are linked together, but every character and story in this book is unique. When I first read that there were numerous characters in The Lobby, I was a little afraid that I would get them all mixed up if I put the book down for a couple hours. Sherman did a great job at not adding too many characters in the stories at once. This made all the characters pretty easy to follow. I also like that instead of numbering her chapters like every other author does, Sherman used time to separate them. Each story in this book was different and I liked them all. Some stories were funny and others forced you to connect to the characters. My favorite story happens at 10 a.m. It was the grandparent’s opinion of their grandkids and their “PGSD” that made me laugh out loud. I never would have thought grandparents would talk like that about their own grandchildren. I also think that Hank Mumser got what he deserved. I love that Peggy finally grew a backbone. I really liked the way that Sherman wrote The Lobby. It was as if the reader was a video camera in the lobby and was able to see what every guest did. This book made me curious about what kind of experiences people have who work in hotels. The Lobby was unlike anything that I have read before. I hope to read more of Sherman’s work in the future.